Raksha Bandhan was originally not a brother sister festival. It has its origins in a rite known as Vedopakarma (the beginning of Vedic Studies). Chapter 124(pg 28) of Narada Purana Vol 4 gives a description of this Vrata performed on Sravana Poornima. It involves tying a Raksha on one's wrist to ensure an auspicious beginning of Vedic studies. 26-28. On the full moon day in the month of Sravana is the holy rite of Vedopakarma' (i.e. inauguration of Vedic studies). On this day the rite of Tarpana unto the Devas, sages and the Pitrs is to be performed through the Mantras of the Yajurveda. (The followers of the Yajurveda perform this rite of Upākarma on the day). The followers of Rgveda (i.e. Bahvrcas) perform this on the Caturdasi day and the followers of the Samaveda perform this in the month of Bhādrapada (on the Caturthi day). The worship of the sages is performed in the manner laid down in one's own Sakha (branch of the Vedas). The Raksa (holy string) should be tied round the hand in accordance with the injunctions. 29.White Mustard seeds, unbroken raw rice-grains and black mustard are washed in water kept in a bell-metal vessel and then tied in a red silk cloth with a saffron-smeared thread. The devotee then worships Devas and prays to Wisnu and others. Delighted in mind, the devotee should lay down to a Brahmana and get the thread tied round his wrist by him. 30-31. Thereafter, he gives Daksina to Brahmanas and begins the study of the Vedas. After ritualistically dismissing the seven sages, he should wear a new sacred thread made by himself and coloured with saffron, etc. According to his capacity he should feed the prominent Brahmanas and he himself should take only a single meal on that day. 32.O Brahmana, if this Vrata is performed, it makes atonement for all omissions and commissions in the Vedic study. If the Vedic rites are forgotten or are performed in contravention of the injunctions, this holy rite rectifies it. 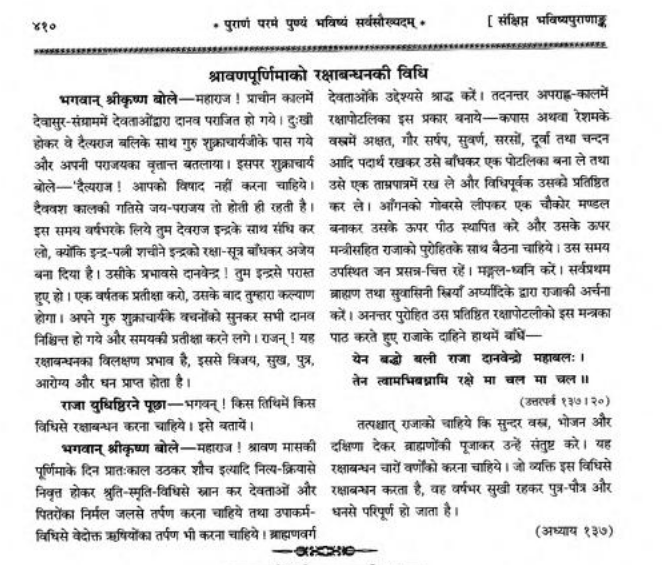 The adhyaya 137 Uttara Parva of Bhavishya Purana gives an account of how Indra grew powerful against Mahabali and defeated him due to a Raksha tied by Indrani Sachi. This story says that the Raksha bestows health, prosperity and progeny to the one that wears it. Here it says that Raksha-bandhana is applicable for all varnas. Here is my translation of the Hindi text (for those that don't know Hindi). This story is narrated to Yudhisthira by Sri Krishna. In olden times of Deva-Asura conflict Mahabali was defeated by Devendra. An afflicted Mahabali inquired Shukracharya of the cause. Winning and losing is due to the wheel of time. For now, for upto a year you should be friendly towards Indra for Indrani Sachi tied the Raksha-sutra to Indra due to which he is invincible. After the period of one year has passed all will be good with you. Krishna to Yudhisthira: O king, this is the amazing influence of the Raksha-bandhana rite, that bestows victory, happiness, progeny, health and prosperity. Yudhistira said: Bhagvan, on which tithi and in what way should the Rakshabandhan rite be performed, please tell me. Sri Krishna said: O king! In the month of Sravana on the full moon day one should wake early and by bathing etc purify oneself and through varied shruti and smriti offer water oblation and tarpana to the devas and pitrs. Similarly one should do tarpana towards the sages. Brahmanas should perform sraddha according to the injunctions of the gods. Later in the aparaha-kala one should make a Raksha using cotton or silk cloth filling it with akshata, white mustard seeds, gold, black mustard, durva grass, sandalwood and tie it into a bundle. This should be kept on a copper plate and with due injunctions (as per scriptures) consecrate the Raksha. In the courtyard a square space should be plastered with cowdung and pedestal should be established where the king should be seated by his priest consecrated by mantras. Everyone should be cheerful and auspicious sounds should be made. The foremost of the brahmanas and married women should perform arghya etc and honour the king with an archana. I secure on you the Raksha which was tied on Bali, the King of demons. Therefore O Raksha! Do not ever fail to protect this Follower, do not ever fail. Afterward the king should worship and satisfy the brahmanas with beautiful garments, food and dakshina. This rite of Rakshabandhana is recommended to all varnas. The person that performs rakshabandhana so described remains happy for a full year and is blessed with ample progeny and wealth. Not the answer you're looking for? Browse other questions tagged identification-request festivals . How a Rakhi band should be?